I’ve finally finished my Blue Lafitte with Beads! 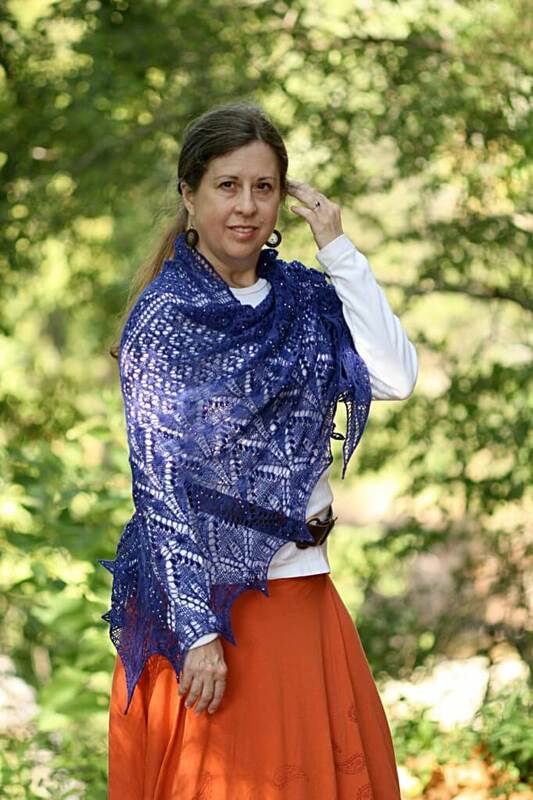 This shawl turned out great and I’m quite happy with it – although I will say there could be more beads. 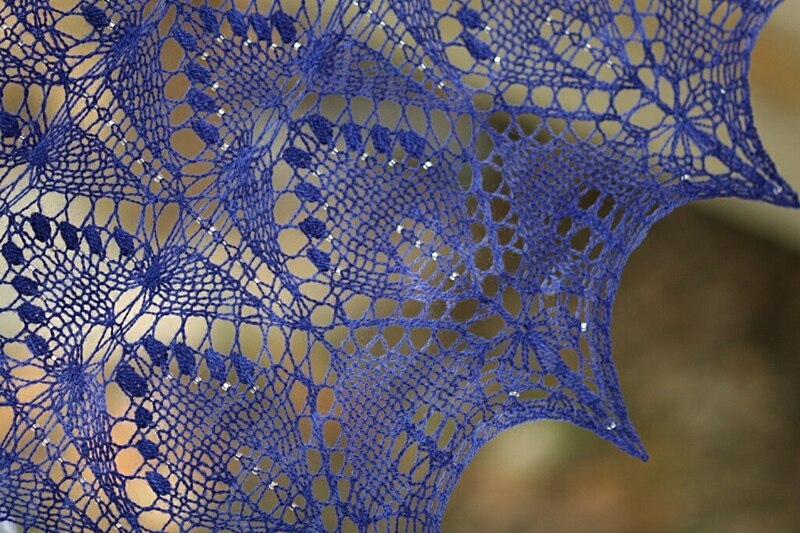 There are a lot of beads on the Lafitte Shawl. 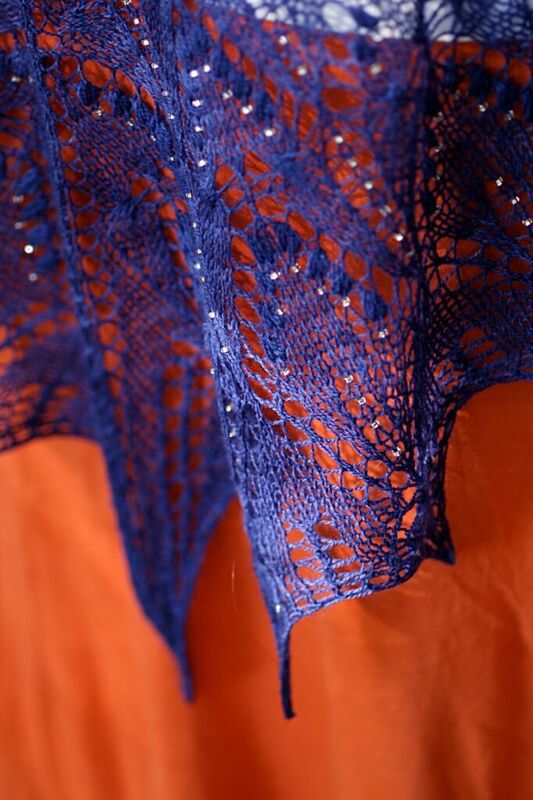 But after blocking it I think more could be added on the last two charts – they really add a lot of sparkle and punch to the finished garment! I love the little bit of weight they add to the shawl as it sits on my shoulders. There was a slight breeze when we took the photos, which made me feel like I was soaring. 900 yards of Oak Barn Merino in colorway Santa Fe Sky. Size 4US/3.5mm circular Knit Picks Harmony Wood needle. 1300 silver lined crystal beads in size 8/0. 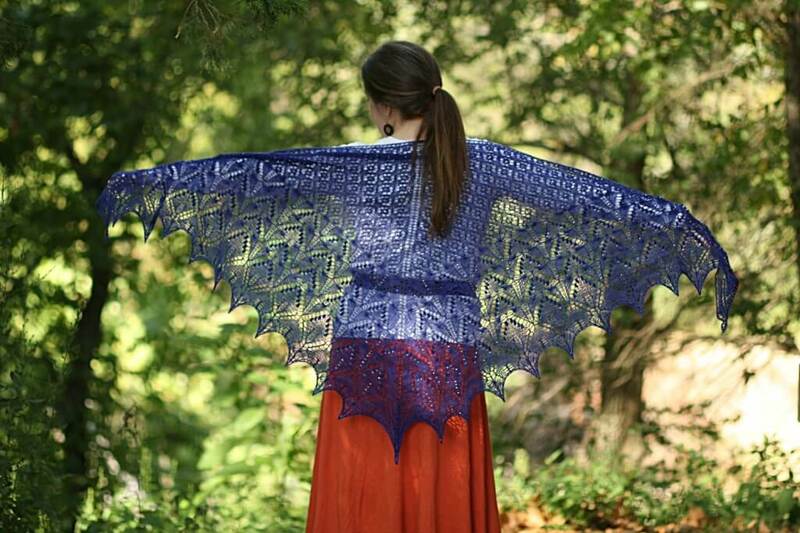 Post blocking size 72 inch wingspan – 35 inch center spine. If you’re interested in the technique I used for beading, here is a video tutorial. I find this method very smooth and easy – not to mention portable. This weekend we’ll be our local Fiber Christmas in July festival in Kellyville, OK. It will be good to see all of the local vendors and enthusiasts. Then we have a week off before two back-to-back big road shows. I’m incredibly excited about these shows! First up is STITCHES – Midwest in Schaumberg, IL (Chicago area). It’s a huge national-level fiber festival and while I’m mildly nervous I’m going well prepared with as much yarn as we can possible fit in the van. Of course, this event is like all fiber shows – it’s full of knitters and I know we’ll have a great time and meet some wonderful folks. Then we have a few days to enjoy Chicago before heading to the next weekend’s festival in Newark, Ohio for the Mid-Ohio Fiber Fair, which will be good fun as well. One of the perks of traveling off the farm is that we get to meet knitters that I’ve corresponded with either through Ravelry or by email. At Mid-Ohio I’m looking forward to meeting my friend Laurie (luvs2sing) on Ravelry. 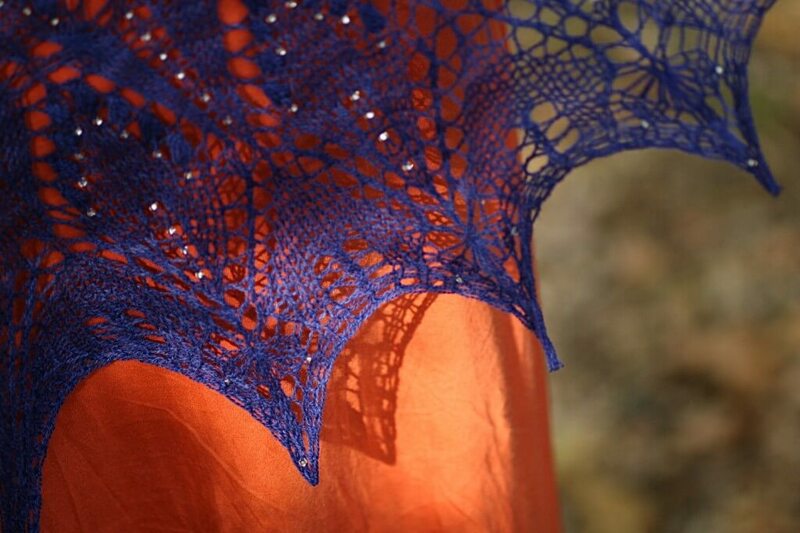 Laurie was one of our test knitters for Lafitte and I’m hoping she’ll wear her shawl to the festival. Being a bit nervous about big shows isn’t a bad thing. I’m going prepared with beautiful yarn to sell and a bunch of gorgeous shawls to wear with my usual skirts and cowboy boots. The few times in my life that I’ve had “flying dreams” I was wearing beaded shawls in the dreams. They say flying dreams symbolize confidence and high spirits (unless you crash in said dream – but thankfully I’ve never had that happen). Absolutely gorgeous! I have some camel/silk that will be just perfect for this! 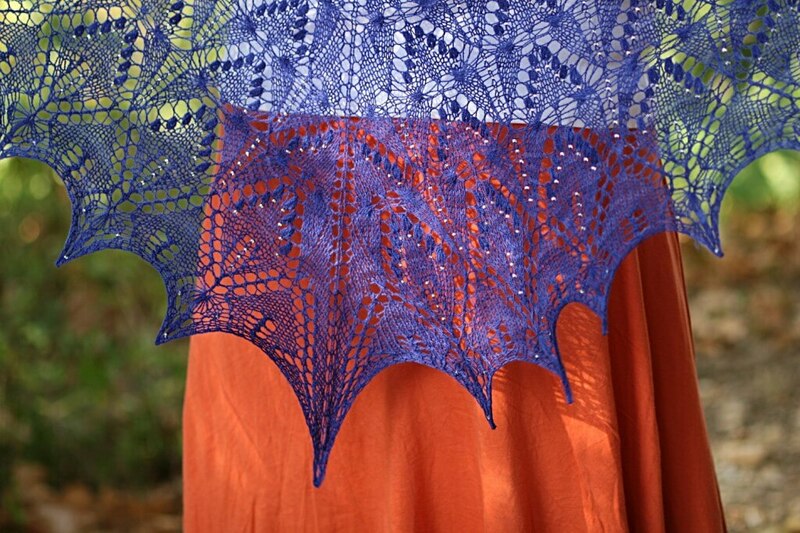 I’m almost through the first chart on my evergreen Lafitte shawl, and thanks so much for this beautiful project! I’m making it for my mom for Christmas. How would you recommend adding more beads to the last chart? And, where can I pick up more beads? I got my initial stash at Fiber Christmas, and I forgot to grab spares.